Hillsboro's internet utility is coming in 2020 for some neighborhoods, city says. On a sunny Friday morning, crews in bright orange vests and hard hats run flexible pipe into the ground outside W. Verne McKinney Elementary School. A few traffic cones divert traffic as men with shovels dig and a large industrial boring machine thunders just off the street. 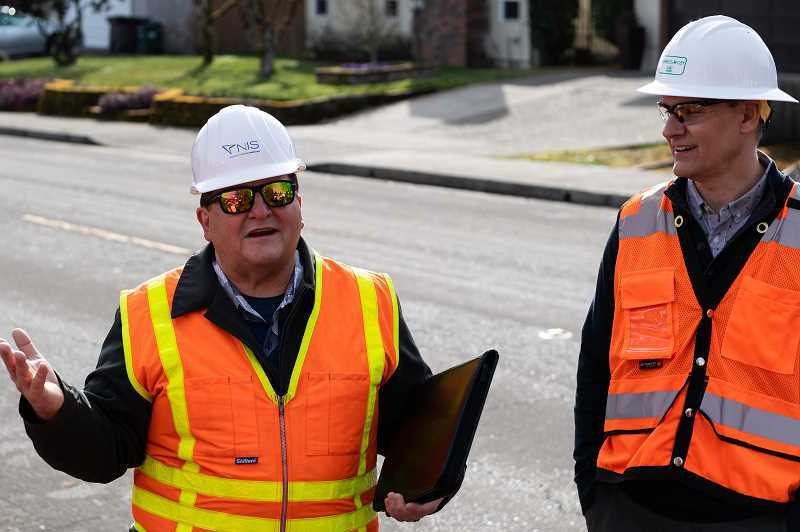 It's the kind of construction work you'd expect in any residential neighborhood on a warm spring day, but the construction site marks the first tangible evidence of the city of Hillsboro's new fiber optic internet utility, expected to launch in early 2020. For the past year, the city has been working on launching its own high-speed internet service. The project would offer up to 1 gigabit upload and download speeds as a city utility, similar to its water or sewer services. On Tuesday, March 19, city staff unveiled the name of their new service: HiLight — a portmanteau of "Hillsboro" and "light," according to Megan Eatough, the project's spokeswoman. Light is what fiber-optic internet uses to send data. City officials said last spring that having access to high-speed Internet is a necessity in the 21st Century. City leaders said the best way to bring more affordable high-speed internet access to the community was to make it a city utility. "Broadband is essential," Hillsboro Mayor Steve Callaway told the Tribune last week. "Every city in one way or another needs to provide this. For some, that means private companies, but for us to be able to do this is great." Municipal internet is rare in Oregon, and Hillsboro would be the largest city in the state to offer its own internet service, though several other Portland area cities are looking into similar projects, including the city of Sherwood and Multnomah County. "There are lots of eye on us, not just locally but nationally," said Greg Mont, the city's information services director. "We are one of the bigger municipalities nationwide to do something like this," Mont said. The city of Longmont, Colo., a city about the size of Hillsboro, runs a similar city-owned internet service. Chattanooga, Tenn., a city about half-again as big as Hillsboro, has operated its own fiber-optic network since 2010.